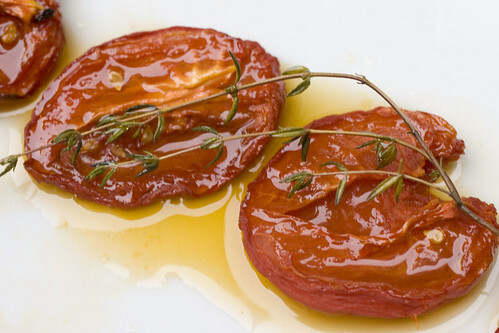 So, these slow roasted tomatoes are special to me. I learned how to make them during my externship at Aix (now closed), under Executive Chef, Didier Virot. These tomatoes were part of the signature appetizer (which I will also post about soon) that got ordered at nearly every table, every night. It really was spectacular, and that’s largely due to these slow roasted tomatoes. I heard they tried to take it off the menu once because the staff was sick of making it, but the customers wouldn’t let it it go, always asking for the tomato tart. It did kind of become the chore that no one wanted to do. It’s a lot of work and cases and cases of tomatoes turn into very little after they concentrate every drop of goodness. While you do it, your fingers turn into raisins, and it can just feel very repetitive. Blanch and peel the tomatoes, halve and seed the tomatoes, lay them out, salt and sugar them, over and over again. It could be your assignment for 5+ hours. But these days, since I don’t do a restaurant quantity, I find the process very relaxing. I can do most of it in front of the TV, pretty mindlessly. I make a lot when I feel like it and it stores well, so that I have them whenever I want. 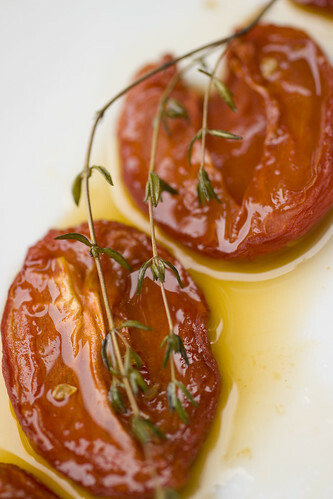 The slow roasted tomatoes can be eaten whole or chopped up, served hot or cold, eaten alone or used like a topping or condiment. They can be used to flavor other dishes, mixed it into pastas or rice, tossed with sauteed string beans or some bocconcini. The possibilities are endless. Consider the recipe just a guideline to get you going. I don’t usually measure while I do this (but I did measure to write this recipe) and you can start experimenting with different herbs. 2. 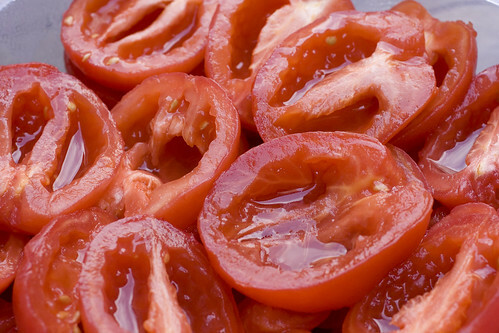 Place one layer of tomatoes (cut side up) in a tupperware container with a cover. Sprinkle with a little salt and sugar. Place another layer of tomatoes on top, again sprinkling with a little salt and sugar. Continue until you are done with the tomatoes. Seal the container and refrigerate overnight. 3. Preheat the oven to 275 degrees F. While it’s heating, let the tomatoes drain in a colander. 4. Lay tomatoes on a sheet try (you may need two), cut side up, in a single layer. Drizzle with olive oil. Scatter the thyme around. 5. 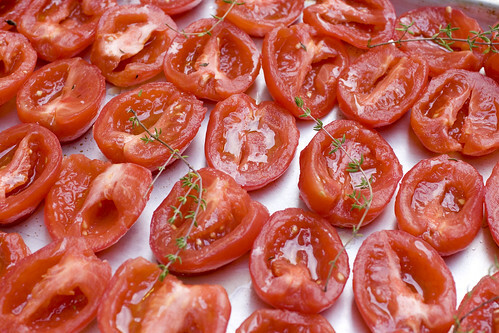 Place the tomatoes in the oven and roast for 2 to 3 hours, depending on the size of the tomatoes. Start checking at 90 minutes if your tomatoes are small. Rotate the pan(s) in the middle if your oven has hot spots. They are done when they are shriveled, flatter, but not burning. Eat or cool and store in an airtight container in the fridge. It will last for several weeks. Don’t forget the oil. 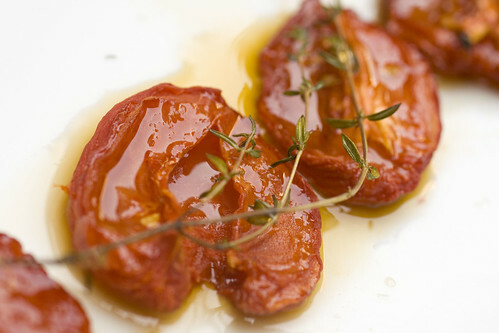 When you roast these tomatoes, you will get a small pool of oil on the pan. Scrape every drop of that into a bowl and use it. Dip bread in it. Drizzle it on fish. Use it! It is an amazing tomato flavored oil! posted by jessica	at 10:33 AM	Filed under French, Recipes. You can follow any responses to this entry through the RSS 2.0 feed. Both comments and pings are currently closed. 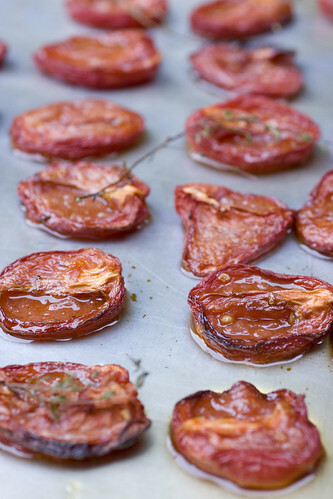 Gorgeous photos, love slow roasted tomatoes! Grace, you’re always funny. Switch to stand-up comedy? Looks wonderful! I still have a few more tomatoes that are ripening in the yard. Maybe I’ll make this with them!